In school days back in the 70’s, I heard that some dead and forgotten American poet had said that “All truths wait in all things.” But I never figured I would or even could, begin to find it in London, Ontario, where I lived for 38 years within sight of the hospital I was born in. That is, until that day I came across a slim book called “Leaves of Grass” by someone called “Walt Whitman” in the library. Talk about ‘inflection points!’ He introduced me to myself! Anyway, as I got into him, I found out that he’d lived in a dusty old town called “Camden” just across the border in New Jersey. The old pictures I saw of it were not at all inviting; they left me with a distinct feeling that Camden would be a hard place to even be from. I had zero interest in going there, ever. Except for one thing: and that’s the small grey ship-lapped wooden two story house at 330 Mickle St. that Walt Whitman died in. It’s not so much that he died there as that he lived there, for the last three years of his life, never recovering for long since he had the stroke. Seems to me his brother lived downstairs, but anyway I do know that every day a young man named Horace Trauble climbed the well worn stairs with the daily papers and news for Walt. 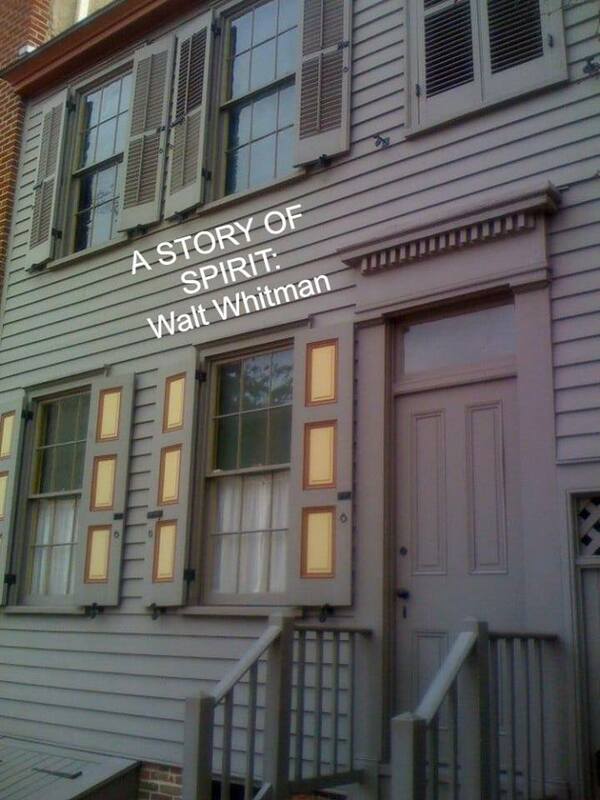 That’s all told in the book ‘With Walt Whitman in Camden’ that Trauble wrote about Whitman in his last invalided years as he lingered one floor up and closer to God, so to speak. President Lincoln: a passing acquaintance. So now, without further ado, let’s turn directly to a small sampling of some of the finest portraits of the wordless and leave you with a little of that ‘something else’ with which Whitman communed, both in his poetry and prose but, more importantly – in an abundant daily life fully lived in the wonder of awareness. It seems useful here to note that throughout Whitman’s writing, he repeatedly talks about – and points to – the same “beloved” as the Sufi poet Rumi. For Whitman, the self is his lover. He – writ large – is his lover, friend and companion in the ‘unicity’, the oneness.